Anyway, this brings me back to the realization that I used to swim almost every week-which explains why I used to be really tan. And I have to admit that I was a pretty good swimmer. hehehe. But of course, I suppose it's a totally different story now since I haven't been swimming for years! I still love it though and whenever the television starts broadcasting any swimming competitions, I'll be hooked! So I'm super duper excited for the 28th SEA Games to come this June 2015 since it will be held right here in Singapore.I’m definitely a patriotic citizen. So, I'll definitely be rooting all the way for our own TEAM SG athletes. And speaking of SEA Games, I’m super honored to be part of the Singapore 2015 Launch Party, a celebration to kickstart the 28th SEA Games and 8th ASEAN Para Games journey. 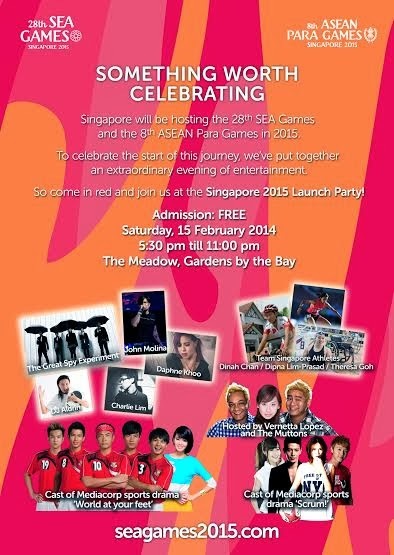 Come on down dressed in red and join me at the Singapore 2015 Launch Party this Saturday 15th February 2014 from 5.30pm to 11pm at the Meadow, Gardens by the Bay! For more information about visit www.seagames2015.com/. I can't wait to catch The Great Spy Experiment there! I've always been a fan of their music and now I'm gonna watch them live?! It's unimaginable. Also, catch your favourite MediaCorp stars from the cast of sports drama "Scrum". Just a few days ago, Fai and I were invited down to Extraordinary Art@Jalan Besar and we totally had a blast. So what is Extraordinary Art? Basically, this event was to remind people of how we should notice and celebrate the littlest things in life. The team behind the event had two booths installed for everyone’s participation. One of which was covered with balloons filled with paint and participants had to burst them using darts. The marks left behind would then form a HUGE beautiful art piece that will be put on display this Saturday at the Singapore 2015 Launch Party. Thankfully, I managed to get at least 4 of out 5. Look at how colorful the booth looked! After which, it was Fai's turn. Ice-cream were also given out for free that day! All you had to do was participate in the games. Next, it was time to participate in the second booth! This one was a little more challenging and like every soccer games, it was time to get dirty. But thankfully, with paint not mud. haha. All we had to do is kick or throw the balls at the white panels and like the first one, every little detail will join up to form a huge art piece. You can check out the final piece at the Singapore 2015 Launch Party this Saturday. Getting our ponchos on just in case the paint comes splattering back at us. And it was my turn!! I decided to use some of old rusty Netball knowledge and throw the ball instead! Sure enough, I hit the panel well leaving behind really nice paint marks. And that was it!! I had a lot of fun but I was glad my day was over because I was at The Lion Men promos before that dancing away. And then, I was at Extraordinary Art playing games, I used a lot of energy and finally KO-ed the moment I'd reached home that day.